Looking For New and Exotic Beach Resorts? USA Today has the top 10 places to view Christmas Lights across the United States this year. The American Club Kohler, Wis. The Farmers’ Museum Cooperstown, N.Y.
Strawbery Banke Museum Portsmouth, N.H.
Stowe at Night Stowe, Vt.
Mary Todd Lincoln House/Hunt-Morgan House Lexington, Ky.
Napa County Landmarks Napa County, Calif.
And I want to add one more to the list, Callaway Gardens just south of Atlanta has an amazing show called Fantasy in Lights. 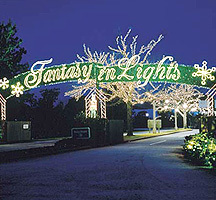 The Bronx Zoo in the Bronx NY has their extravagant display of lights every year. Life College in Atlanta, GA used to have a great display you could drive through and see.